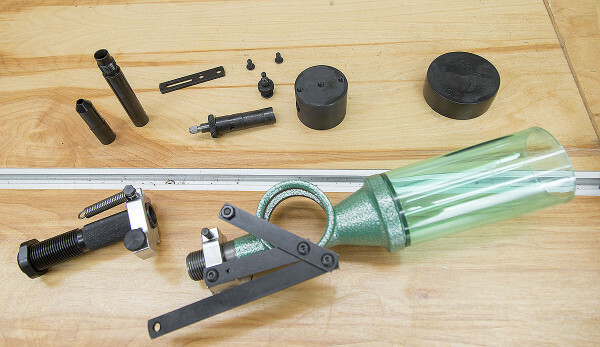 In this post, I’ll continue where we left of in my last post (see RCBS Pro Chucker 5 Press Assembly Part 1) by taking on the assembly of the new-and-improved RCBS Uniflow powder measure. This new version of the Uniflow that’s included with the Pro Chucker 5 features some great updates that include a quick-change metering insert system, and a “universal drum” that’s used for both rifle metering inserts and pistol metering inserts. Now that we’ve unpacked, mounted, and assembled the press, I think it’s time to start cranking out some ammo! Stay tuned for the next post and video which will cover loading 45 ACP. Can’t wait! Thanks, Gavin. You’ve talked about giving more detail on the ultimate reloader bench system. In one video you said you thought the T-tracks were 7 inches apart but you’d put the correct measurement in your blog. I may have overlooked it, but I don’t think I did. Can you tell us the distance between T-tracks on your bench? Thanks for the new info. Looks like RCBS did an improvement over the Hornady powder measure, only ONE rotor assembly with changeable metering assemblies. Of course it looks like a set back too, since the metering assembly doesn’t appear to be ‘quick change’. Looking forward to die setup and cartridge plate installation, unless it’s a universal plate. I have to retract the ‘Step Back’ portion, visited the RCBP site and got further details, one rotor multiple metering, and that is an improvement. I am forward deployed with the Navy and can not access the video. Would you be able to quickly comment on your opinions of the newer Uniflow powder measure compared to the venerated older model? Thank you very much for the time, energy, and resources you spend on this site. Just noticed that your recent posts only show written text( and photos) but all of your videos are missing. Is this just my account or is there some other issue going on. Thanks for all your work. You do a great job!! !